A seriously strange book that I ran across back at the Ames Library was The Tamil Alphabet and its cosmic aspect by P V Manickam Naicker. I found both a Tamil and English translation, but didn’t read it – these images were enough for me to get the gist of it, I think! The symbol for the vowel O was compared to a divine posture, the shape of internal organs, and embryos… I think it’s safe to say that there is a biased take on history in this one! Not a great source of typographic inspiration, but interesting nonetheless, right?! This seems to be something of a genre. The O itself is the framework of the Tamil Om symbol: the O containing a small M in the lower counter. 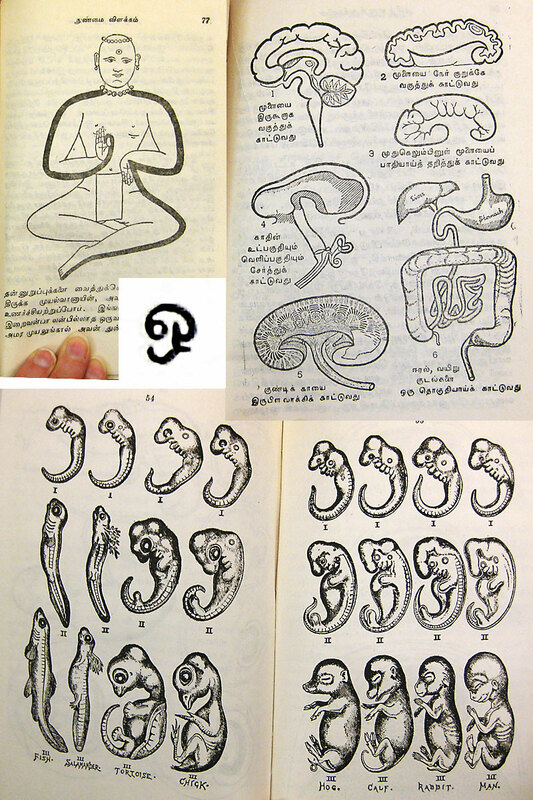 Another guy recently “discovered” that *acttually*, the modern Philippine script lettershapes found (specifically) in the first printed book in Tagalog (1593) were based on shapes in giant clamshells from around 3000 BCE when looked at from different angles. Ah well… There’s always Van Helmont’s “demonstration” that the Hebrew lettershapes were based on the shapes made by the tongue when saying the associated sounds. And the Qabbalah and other mystical associations people find in letters.